To make the rest of the world aware of this problem stoprhinopoaching.com have produced the graph below. The graph indicates that more than 400 rhinos have been killed and the reasons for this will be explained later. As rhino poaching isn’t new, only increasing in South Africa, this exponentially increasing graph will give any animal lover the chills when you realize that the numbers indicate deaths of rhinos. This cold hard truth happens every single day in South Africa and the news channels are buzzing all about it. Only a few poached rhinos survive this inhuman act, but it still takes a few months for this vulnerable animal to recover. Seeing those small black watery eyes, so innocent, with blood rolling down… no excuse in this world justifies doing this! Reasons for this include a high demand for these horns in Asian countries, where they are used for curative medicine. It has been scientifically proven that it is worthless several times. Because of this high demand, poaching has become a very sophisticated crime. The reason might also be that rhino horn sells for more money than gold! Is this also becoming a commodity for the South African economy to benefit from? Absolutely not! This is a horrible crime, affecting a lot of broken hearts when we all read the news that another endangered animal has been poached. Our proud South African hearts are broken, another beauty of nature is slowly dying. 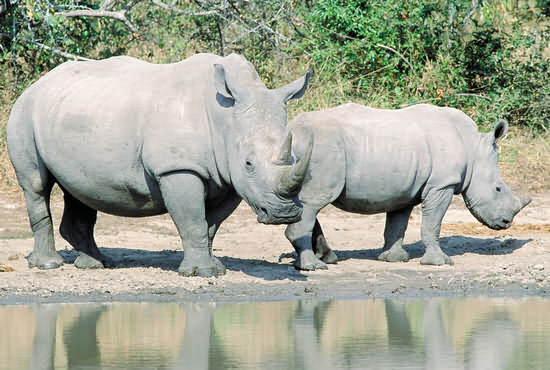 There are two species of white rhinos, southern white rhino and the northern white rhino. Efforts to protect the northern white rhino had no success, there are only seven left. Total world population of all the white rhinos is 20 600. That is almost equal to the human population of fourth smallest country in the world, Palau with a population of 20 300. I bet most people didn’t even know such a republic exists; now how do you want to ensure the rhino population continues to exist? Protection efforts had been put in place, with many ecologists dedicating their lives to these animals. Even if we, the public, can see their success, at least some actions are taken and some poachers have been caught. We have to remember the money is on the wrong side. The high demand offers high prices for poachers to do their job with sophisticated equipment, and only charity supports the good people. It is time for us humans to understand the seriousness of these horrific actions and stand up against it. There are many efforts and charities anyone around the world can support. With only a handful of white rhinos left, our grandchildren might really believe we lived with a species of dinosaurs, as rhinos will only be a tale to tell, with no living proof. Donne Terblans has a passion for writing and often writes on topics such as Kruger national park safaris and safaris in South Africa, as she has a great love for wildlife. Victory in South Africa against Poachers! !